Workle enables its users to work from home for large insurance, banking and tourist companies. In 2012, the portal reported a turnover of $10 million. Workle founder, Vladimir Gorbunov, built his business on the assumption that the Internet makes it possible for many specialists to take their work out of the office and brought insurance and travel services, as well as bank consulting, online. Four years later, the startup has become a $10 million-a-year business. In 2009, investment product advisor, Vladimir Gorbunov, 24, got stuck in an elevator and couldn’t make it to an important meeting. A customer wanted to open an investment account. From the elevator, he consulted his client using Skype and the idea turned into Workle. It’s easy to work with Workle. You register on the site, get a job in an online office and become an online representative of one of several partner firms. This way, you can sell these companies' goods and services and get paid a share of earnings. Workle found partners in three sectors: insurance, banking and tourism. The list of 60 partner companies includes Russia’s largest insurers (Ingosstrakh, Alfa-Strakhovanie, Uralsib) and banks (Home Credit Bank, Nordea). It was quite hard to find partners. “We were met with caution in all of the organisations we wanted to work with, especially with larger companies,” Gorbunov says. “People didn’t understand how the new service worked and said that I was wasting their time.” But the portal became operational and Workle generated about $10 million in revenue in the companies that it worked with in 2012 alone. Gorbunov was the first investor in his startup. He already had an investment business prior to the online company and he spent his personal savings on it. Workle was said to have raised $3 million in its first round of funding. The Skolkovo Foundation gave Workle another $9 million in 2011 to develop the Internet platform (the startup is a Skolkovo resident). However, the average monthly is about $1,000 - $1,500. 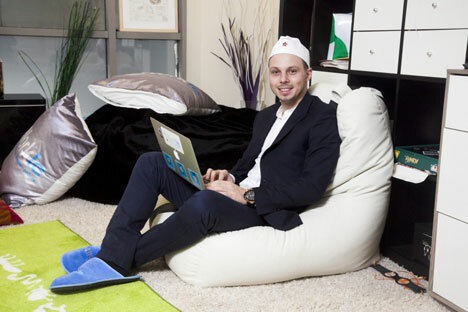 Superjob.ru recruitment portal president, Aleksei Zakharov, agrees that people can benefit from Workle. “It is a good instrument for people wishing to try their hand selling insurance policies or loans,” he says. Workle plans to expand its business and is currently in talks with a Russian investment fund. “The Russian market for online work has a big growth potential. The segments on which Workle is currently focusing have excellent prospects,” says Nord Capital senior analyst, Roman Tkachuk. He believes that Workle has already carved out quite a niche for itself in the online sales of bank loans, insurance policies and package holidays. Gorbunov plans to increase the number of users to half a million in 2013, and 1.5 million in 2015. Another major challenge is to expand geographically. “In late 2013, residents of some of the CIS countries will be enabled to work online. The next step will be to access the Indian market,” Gorbunov says.